If you want to buy the children gifts, please don't buy what you want without thinking what we need. This applies to most charities. Listen -- and the charities won't gush candy-floss-smiles of insincerity. We and others will be genuinely grateful, if you'll please just listen. 1. Some charities have a religious point of view. We don't. And we won't force a religious philosophy upon the children in our care. We do gratefully receive donations from people of faith. We have been helped by Muslims, Jews, Christians, Buddhists, Hindus, Quakers, Shembe, Agnostics, Atheists, Communists, and many others. Similarly we have helped burns survivors who have no religious faith or those of at least five different world-known religions. As such, it is totally inappropriate for people to walk into our premises and put crosses around the necks of the children. We have helped child burns survivors who were intentionally burned by soldiers. And a toddler tortured by burning by other children intent upon killing him. And children set alight by their own mothers, or fathers, or stepfathers. The one core philosophy that we have is Pacifism. Our children cannot glorify violence. They cannot watch wrestling on television because they cannot readily tell the difference between fake violence and real violence. They do not have toy guns. 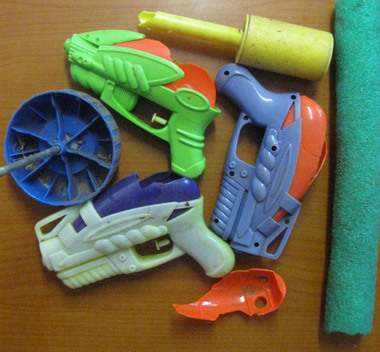 The only exception is water pistols because splashing with water is usually gentle, playful and is not mimicking killing. Please don't give the children weapons. If you do, we will simply let the children take a hammer and break them and put them in the recycling bag. It is impossible to stop all sweets. But we try. Why? A multitude to health reasons which are really personal to each child and not for sharing with the public. But a few pointers include being HIV positive - excess sugar can drag down the CD4 blood count and shorten their lives. So please don't. Or children who will have to have general anaesthetic if they need a tooth filled, because of mouth or head injury, or because of intellectual development. Preserve teeth, lessen decay, cut out sweets. Or diabetes linked issues. Or obesity. Or simply because we are the parents and it is our choice not to pump them full of excess sugar. This is in a context where the South African diet has more sugar than in many other economies e.g. there is even sugar added to tomato soup! So please don't give us sweets. And please don�t give us bags of sugar. Nor huge containers of oil. And please don�t give us cakes unless we ask for them first. We like Fisher Price; we like Lego or other quality toys. We like Staedtler pencils and crayons. We won't like you more if you bring 20 or 50 or 100 toys that break in the first hour, or break on the first day. We'll like you such a lot, if you bring something that children can share, that is sturdy enough to share, that can survive three months or even a year. Most of our kids are from shacks. So the middle class darlings of Sandton might get excited about delicate butterfly wings at a party but mostly our kids see them for the synthetic frippery that they are. Mostly our kids know what that money can buy that they really need.... like petrol to/from hospital .. like the phone bill to call doctors ... like gauze and topical antibiotic. They sigh like we sigh when they must oooh and aaah over something that they really don't need and don't even covet. Please don't buy vast quantities of plastic tack but look at our wish list and get something that we need and like. Hey! We're based in South Africa and we help people who are badly burned and who are financially poor. So of course the demographics of the country and its unique history mean that 99 per cent of the kids that we help are black and poor. They aren't previously disadvantaged. They are still disadvantaged. But we help because they can't even afford the taxi fare to and from hospital and because their families live in shacks or rondavels, so they can't accommodate a child still-bandaged fresh out of hospital. But do we want your money solely because you want a BEE certificate or a tax break or both? No. And if a bus of white children crashes into a petrol tanker, are we going to refuse to help those children because of their skin colour? Heaven help us that we even have to tell you this. We help children because they need help, not because of their skin-melanin levels. We can provide a BEE letter and a Section 18a tax certificate for donations above R1000. But we look forward to the time when asking about the skin colour of beneficiaries stops � is that really the world that we want to live in? Most people are decent, kind, loving, caring. But the donations that we and other charities receive would astonish you. We have been given used syringes and out-of-date cancer medication from unknown sources. We have been given endless dirty and broken toys. We have been given pornographic magazines. We have been given military magazines and books glorifying murder. We have been given broken computers, broken vacuum cleaners, and useful equipment like tel/ans/fax machines missing one essential part. We have been given lots of single odd shoes. Soft toys are quite boring to most of our children (though we do hand them on to burned children in hospital) and dirty soft toys are a hygiene risk. Old torn grey hotel linen is of no use. "Guess" branded clothing intentionally slashed to prevent re-sale would condemn our children to wearing damaged designer clothes. There is this perception that we have endless time to wash and stitch and glue broken things. We don't. There is maybe a place for a new charity to taken in all the things that people dump when they are emigrating, moving house or an aged relative dies, but most charities would like it if you treated them more kindly. So please don't give us things that are broken. We celebrate Christmas in the spirit of giving. We take useful presents (school bags including healthy treats) to the children of Joe Slovo squatter camp on 25th December every year. Help with our "Happy Healthy Christmas Packs" is very welcome. But parties....? Yes, we have an end-year party for volunteers, children, teachers from the sister-charity, and staff around 14th December each year. Do we want a party every week in November? No, not really. So why not extend the spirit of giving and if you want to be particularly nice to our children, reconsider the timing? Your Christmas kindness could be better used, if it became a party in January or March or July or most any month other than November and December. Alternatively you could fund a fun educational trip to Montecasino Bird Gardens, to Johannesburg or Pretoria Zoo, to the Cradle of Humankind, etc. Outings start from about R1000 (100 pounds sterling) for a bus and petrol and those trips are far more appreciated than too many sugar-highs all at the same time of year. A kind donor gave us about 50 newly-bought little fluffy blankets. We had NO use for them. We do occasionally give thick warm good-quality blankets to fire survivors when their shacks have burned down but it is not our focus because government can usually provide blankets for those affected by a big fire. So we had these too-small blankets that we just gave away. The money they cost would have helped us SO MUCH MORE! The same for eight huge cabbages from two different donors who did not ask if we needed them. If we are �running on empty� we�d put out a public appeal, but we have children to feed every day so naturally we plan our shopping. The cabbages were given away to other people/ organisations. 9. Have a little faith in us. Mostly we would rather buy the shoes or books or bandages that we need, because we know exactly what we want and when. Unfortunately the public insistence on giving things rather than money often means we don�t get what we need when we need it. After nearly 17 years of helping badly-burned children we are actually quite good at what we do, so have a little faith. Please don't focus on parties in just one month of the year. Please give because you care, rather than because you're trying to collect certificates and letters or - worse still - photo opportunities with cardboard cheques. If we spend all our lives writing letters or trawling through records from ten months previous, when will we get our core work done? And where do we draw the line? A donor in 2011 of Rand 48 (about four pounds sterling) wanted a letter, a photo of what we spent the money on, and more. R48 buys seven tins of baked beans if you're lucky. Taking the time to take the photo, get it printed and posted, etc and we are seriously in a time deficit let alone a financial deficit. We thank everyone from the bottom of our hearts who helps because they care. We will tell you so face to face when you cook supper, teach a child the piano, deliver soaps and toothpaste, or arrange something like a train trip. But when children need bandages changed, or surgeons to be negotiated with, or their antiretroviral medicines carefully measured because they're only two-years-old, or an abuser arrested, or a fire survivor needs something to eat right now, we'd rather get on with that and keep letter-writing bureaucracy to a minimum. Please don't think we don't care about your effort. We do. But let us work on the urgent priorities for those that need us most. A wish list available by email is typically updated every two months. Email us on firechildren@icon.co.za if you would like a copy. 8. Buying quantity over quality is a mistake. These shoes survived two weeks. 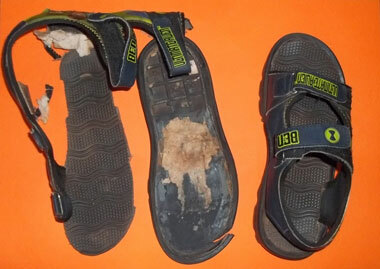 Two pairs of the same brand of cheap shoes both broke within the first fortnight: December 2011.